Last year was such a fun year creatively. 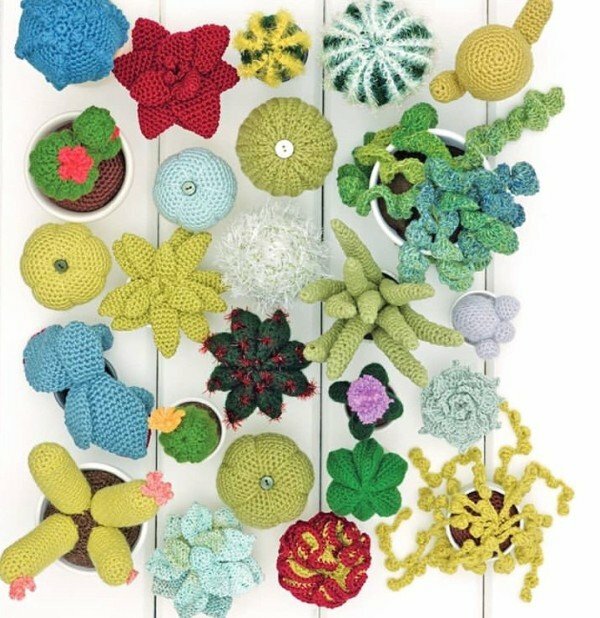 Not only did I write Crocheted Succulents (see previous post), I also worked on a a really fantastic collaboration with West Yorkshire Spinners. 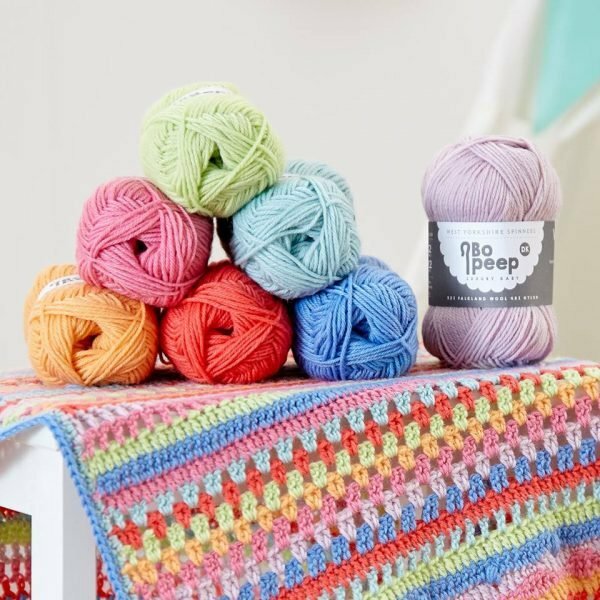 We talked about developing a pattern collection for Bo Peep yarn for nearly a year. 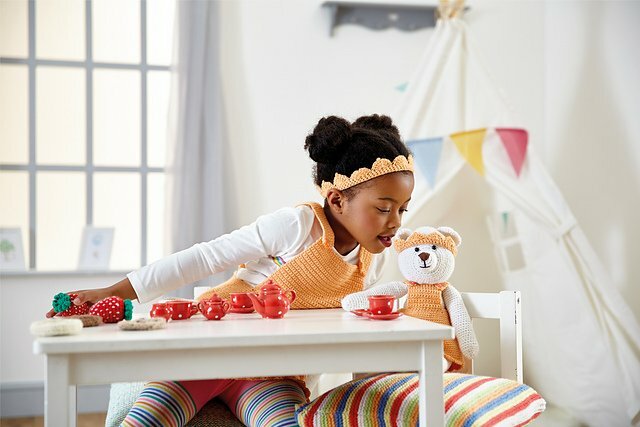 After looking at the colour range and chatting about the concept we decided that it would be a brilliant fun idea to create a ‘best friend’ Teddy Bear: Bo. We then thought it would be fun to match Bo’s wardrobe with items for kids. My imagination ran wild. When I was a child, my teddy bear was always the best companion I had for imaginary fun. For a bear to have that important ‘pillow status’ he needs to have a kind face and cuddly feel. The bear I created is perhaps a third larger than my normal creations. When you design a toy that will have clothes you really have to think about leg, feet and arm proportions and have ears that will work with a number of hats. It must be easy and enjoyable to dress the toy. Nothing too fiddly or annoying, but something that will be fun and nurturing. We care about our bears and we don’t want them to get cold. Oh my…I made about 3 fully created versions of Bo before the final pattern was settled upon. Then it was all about the clothes. 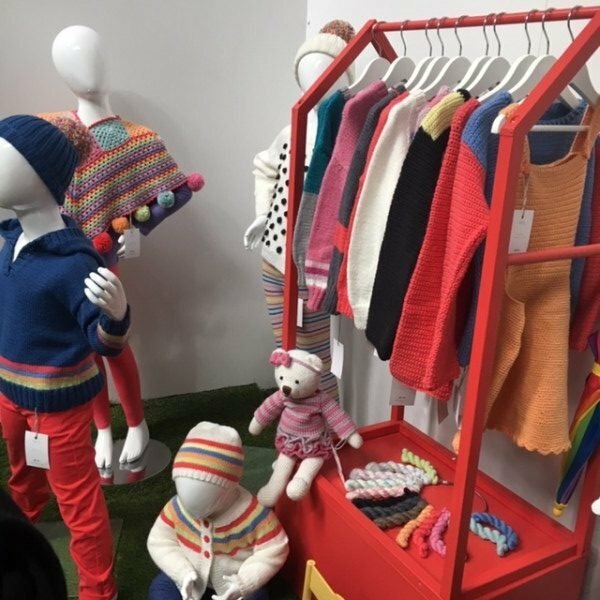 I have my favourite looks and indeed some of the designs were based upon the clothes I made for our son many years ago. The poncho was based a on design I made for my young friend Betsy. 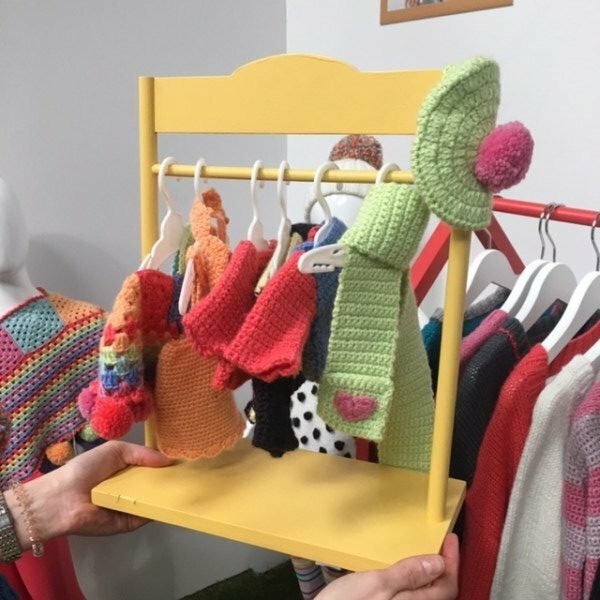 In fact when I created jumpers, hats or scarves I generally have a child in mind who I know would love to wear the outfit. 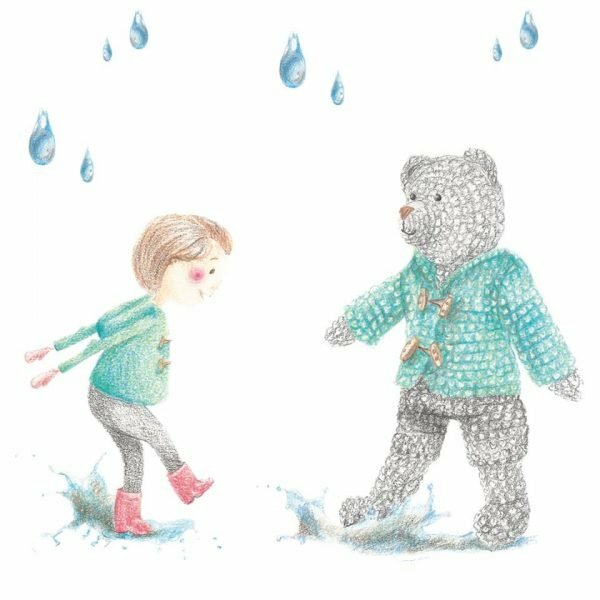 There are jumpers, dresses, hats, scarves, bags, all to take on a joyful adventure together. This book is definitely a dream come true. 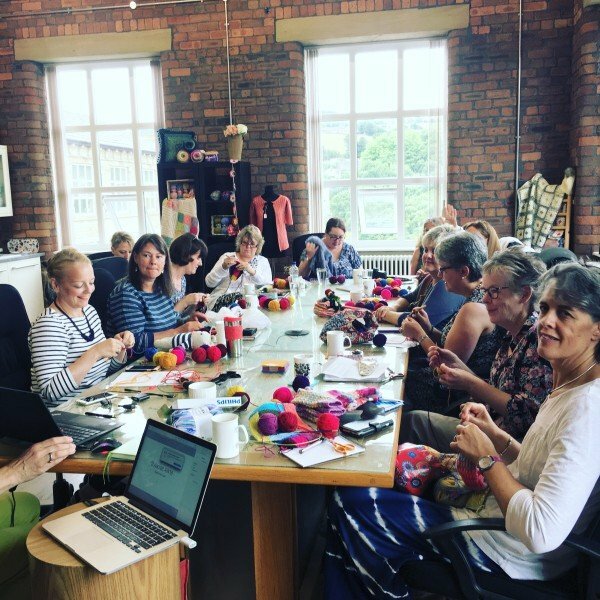 Working with West Yorkshire Spinners was such fun. 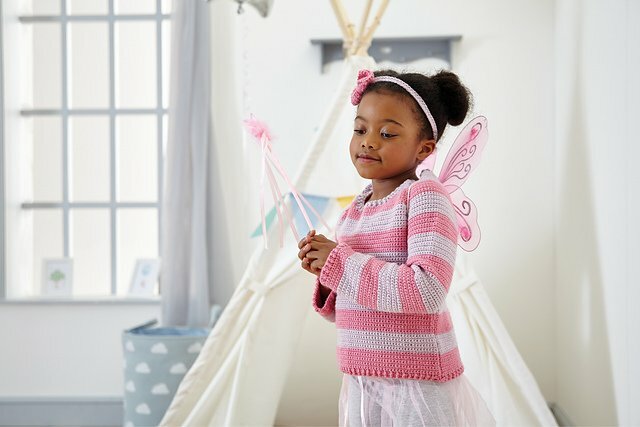 I began my design career creating knitwear designs for children and it was fabulous to return to my roots. I couldn’t have done any of it without the super talented, Rhiannon. Rosee Woodland, Helen Birch and my friend Lynne Rowe made this publication incredible. I think the colours of the yarn, the glorious illustration and the range of patterns make this book enchanting. If you like it will you tell me how you get on. 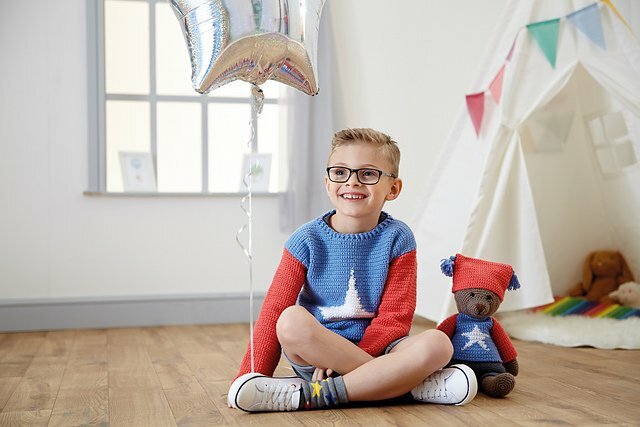 I would love to see your bears and their little owners. Pop across to the Facebook Page or used #bopeepbear over on instagram. We can’t wait to see. 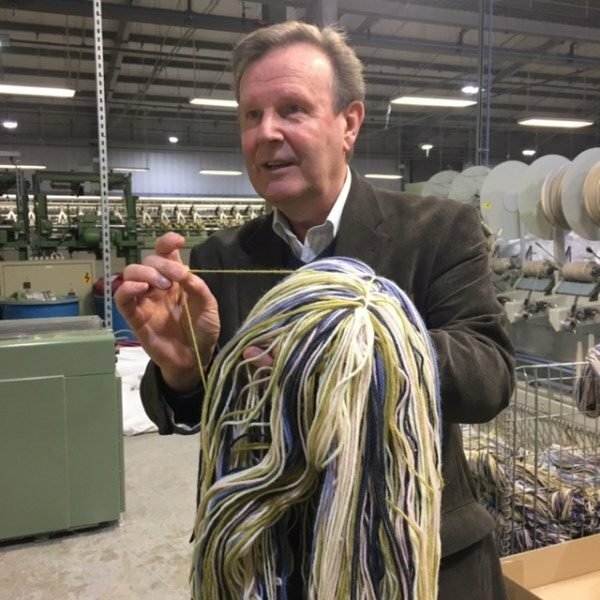 The book and the yarn has started appearing in many yarn shops and is available via on-line retailers. If you are in the U.S.A the book is being distributed via Sirdar yarn so you can ask you local stockist if they will be having the book available. I have a special give-away this weekend – so if you are interested please pop back to get involved. 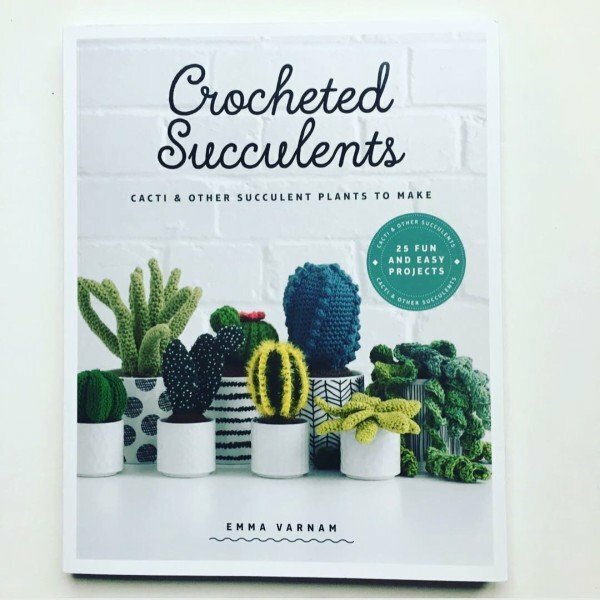 New Book – Crocheted Succulents – how it started…. Do you have moments of creativity which you seem to remember forever? 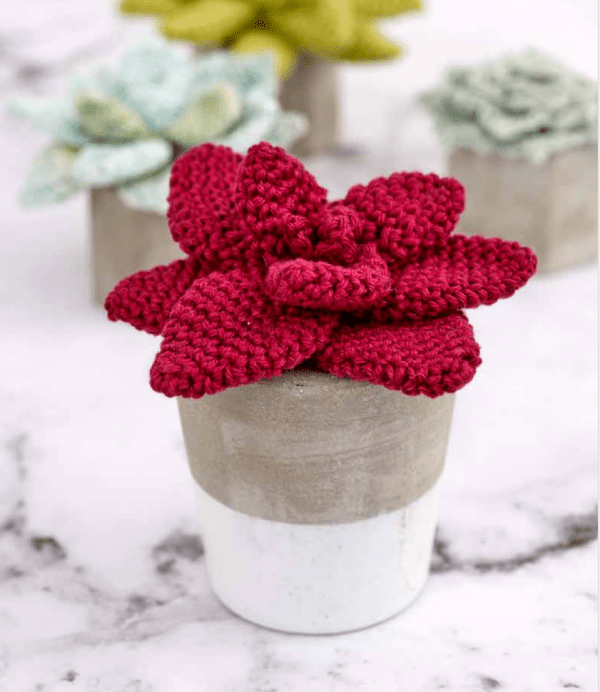 You know, when you stop and think…’ah I’ve had an idea!’ When I was creating an writing my new book, Crocheted Succulents, there seem to have been more than the normal moments of joy and excitement. 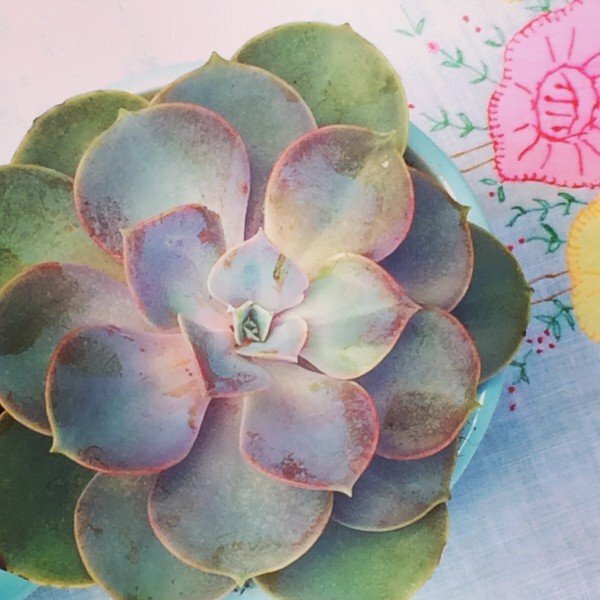 It was quite a few years ago that I started to find succulents fascinating. In the last few years they have grown in horticultural trending. My real love affair with these fleshy beauties began in South Africa. Seeing so many of their regular, colourful leaves in their natural habitat was enchanting. It dawned on me that with our ever changing environment, growing succulents might be an important skill to develop. 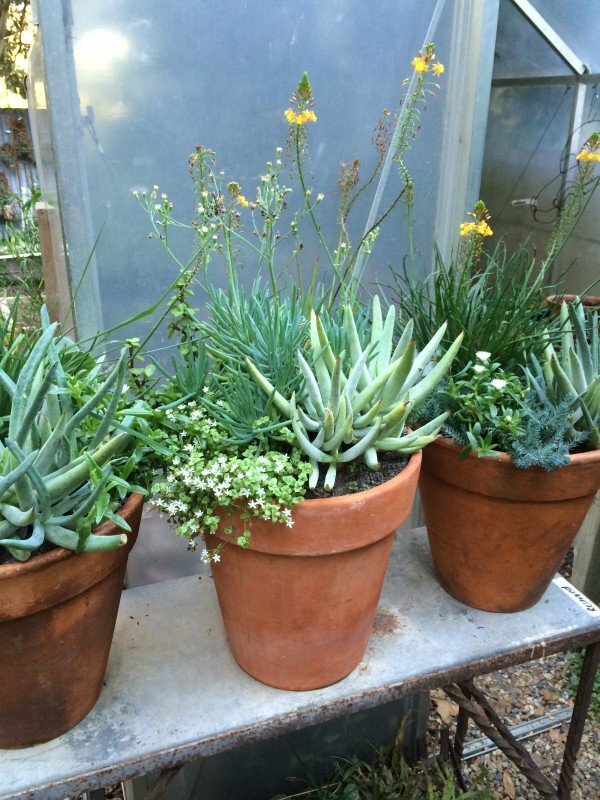 I began buying the plants and increasing my knowledge of their care. At the same time our son began collecting and purchasing Cacti. I don’t have quite so much love of the spiky fellas. But B finds them very endearing and gives each of his collection names like Bob and Muriel. I know don’t ask me why. At our local garden centre, Bud, the gorgeous own Brenda encourages B with top tips and points out all the new and fascinating varieties that have begun to appear. She suggested that we went on a course to learn how the look after our growing collection. Well if you have followed this blog or my instagram account you will know that I have used these plants often in my photos. 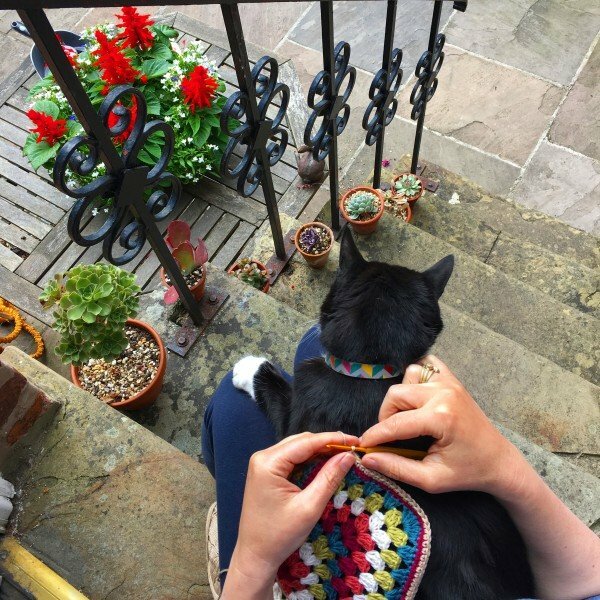 It was my editor who suggested, why don’t you think about making some in crochet? She is a genius…. How this process usually goes is that we have an idea….I then think..’no I don’t have time. Then I spend 3 or 4 days thinking of nothing else. For this particular book I had a discussion with my crafty friends Lucy (Attic 24) and Christine (Winwick Mum). By then end of a very long conversation of me talking round the houses of creating the book. They rather astutely realised that even though I didn’t really have the time to write it. I was going to anyway. The deal was finally sealed in my mind on a little Saturday shopping trip to Black Sheep Wools. I found some amazing spiky yarn by Rico. It is called Bubble. 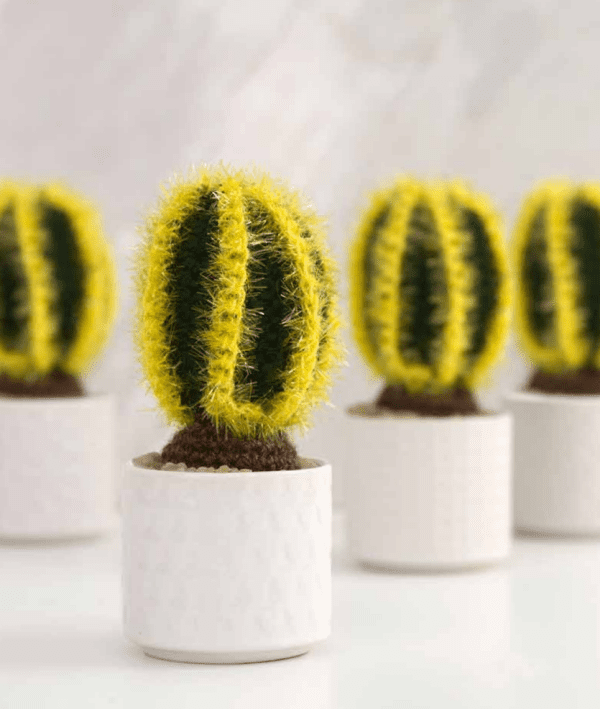 I knew immediately that it would be brilliant to create the fine spikes on the outside of the cacti. I went home and like a crazed woman on a crafty mission created my first design for the book. When I had stuffed it, placed it in a plant pot and stuck it on the mantelpiece, it made me chuckle with delight. Not event thinking I took the photo and sent to some of my close friends. I must be a VERY random person to be friends with. Well 24 projects later and the book was finished. I did quite a bit of research in my local Library. I bought a load of gorgeous plant books and you will find that each project is based on a real plant. 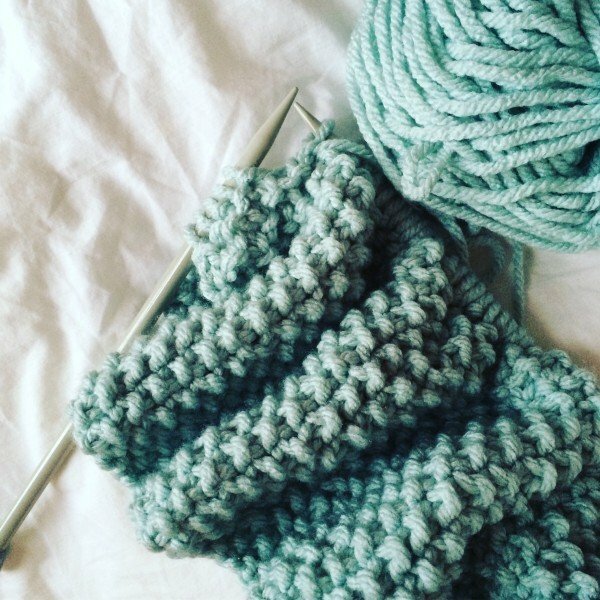 If you have basic crochet skills you will find the projects quite easy. 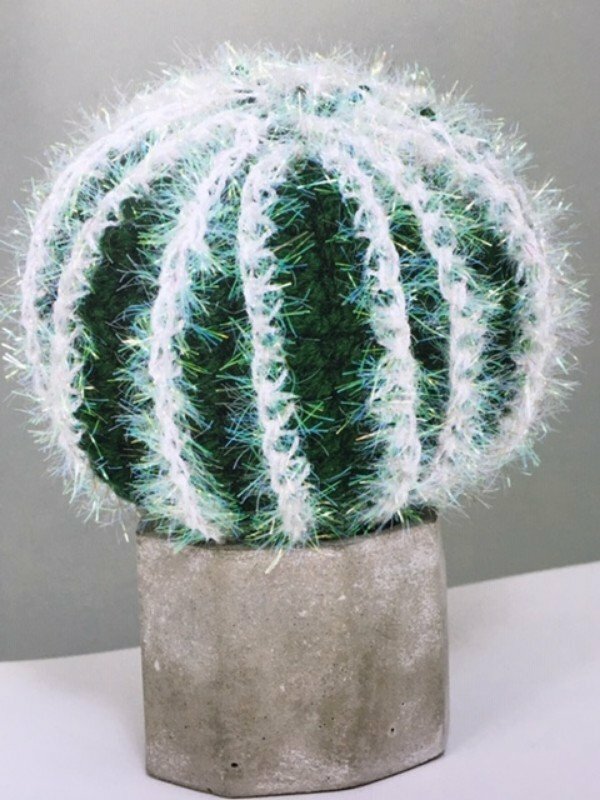 I have provided lots of description of how to construct the project and how you can manipulate the leaves or create flowers to decorate your cactus. There are also some patterns for pots and lots and lots of technical diagrams. I really can’t take credit for how beautiful the book looks. The lovely people at GMC have done a fantastic job. Particular thanks should go to Wendy, Jonathan, Neal, Martin and Wayne. Jude Roust and Nicola Hodgson did all the checking (thank goodness). 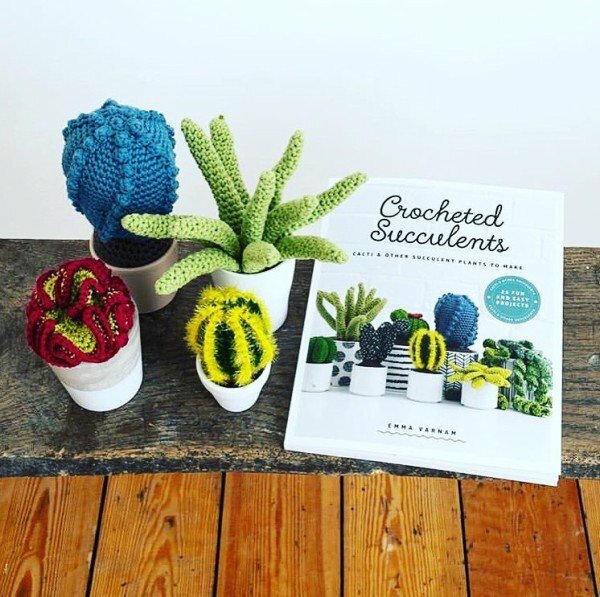 Lots of lovely people have asked me if I will make them a crocheted succulent. My answer with a cheeky twinkle is…why not buy the book and see if you can make one. They are alot of fun, and best of all you can’t kill them! Sometimes you make something and you feel just a little bit joyful about it. You have an idea, plan a project, make it and then it turns out grand. This is true of the Circus Blanket. The idea, what it would look like and how I would make it was a thing of moments. Those are really the best. I’m telling you this – because it is not always so. Sometimes the ideas, the design seem to be very hard won. 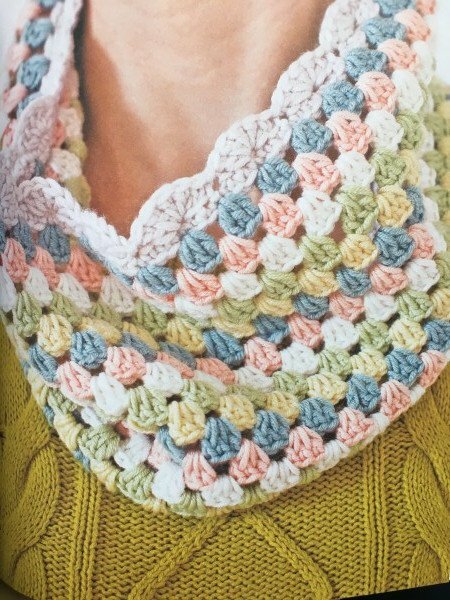 This design is issue 110 of Inside Crochet Magazine. I love working with this magazine and when I can it is great fun to collaborate with the team. I have used the gorgeous faded shades of Stylecraft Batik DK. 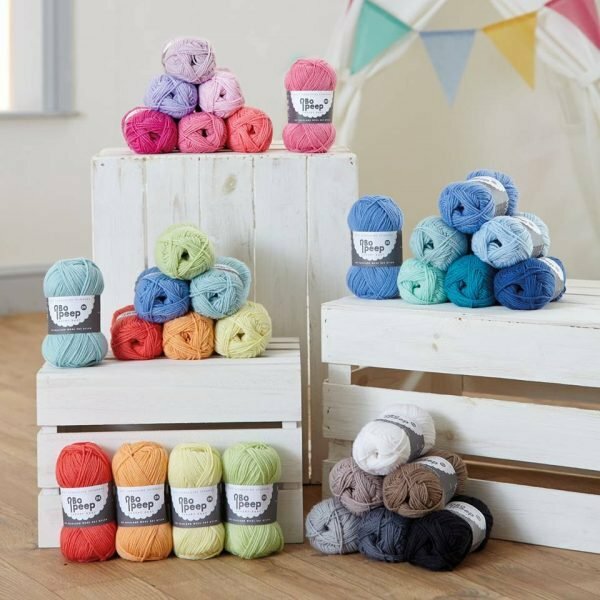 This yarn is a firm favourite with me for crochet. It is beautiful to work with and I always enjoy the muted shades. I matched a rainbow of colours with Stylecraft Life DK. For me the slightly lighter twist of Life, works better with Batik. I find Special DK is a bit too bouncy and fluffy to match the tension. Now my friends you can work this blanket in two ways. It is worth you knowing before you start. The basic design uses the corner-to-corner technique; building on treble cluster blocks diagonally. In the magazine I have provided some technique photos. But if you are unsure then do look at the myriad of video tutorials available on the web. 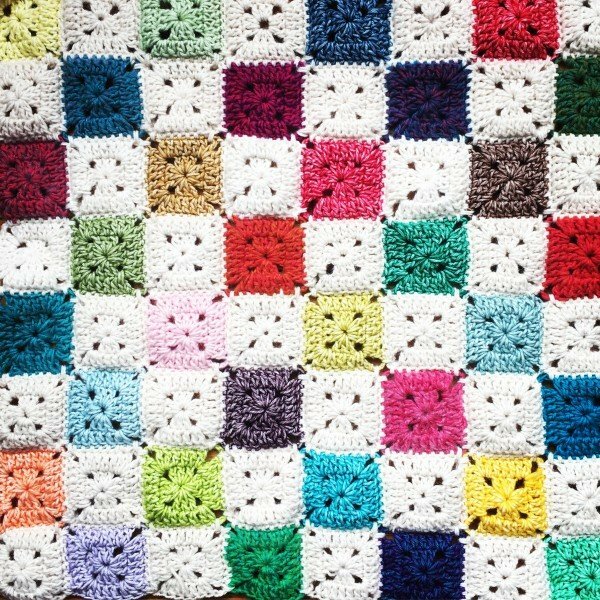 Because there are many different colours involved in the blanket. 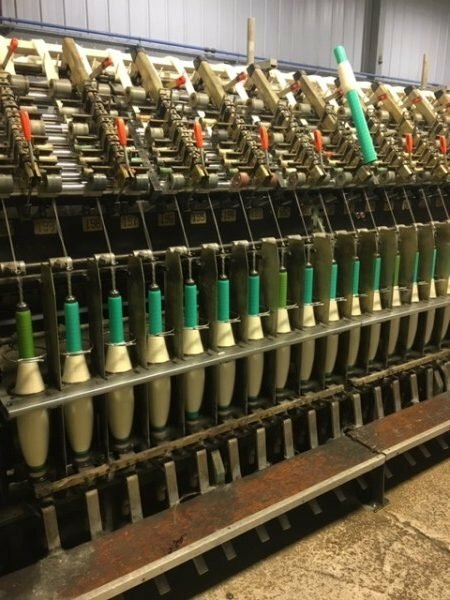 That does mean there are quite a few colour changes (that also means ends being sewn in – don’t be surprised by that). 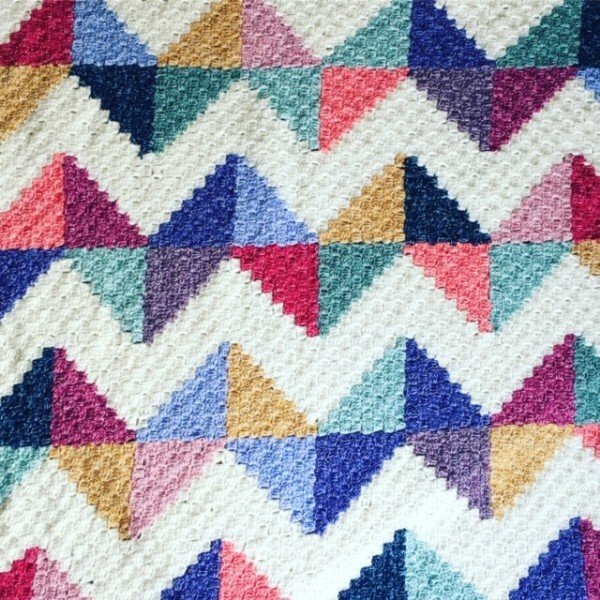 If you don’t fancy working on a large diagonal you can break up the design into squares and then sew the squares together. This is an easier option for a beginner. 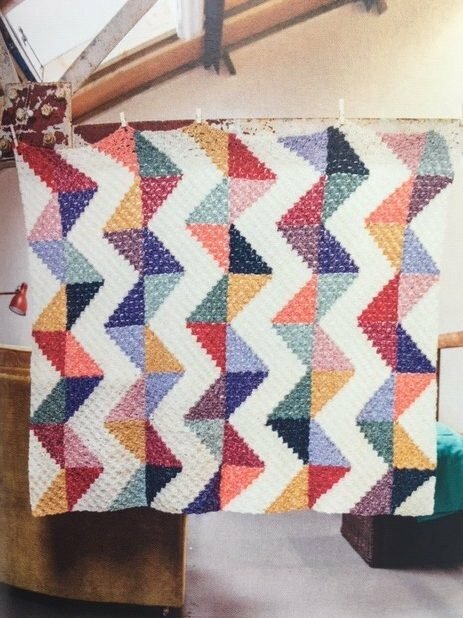 This blanket design is totally inspired by patchwork patterns and the wonderful illusions that repeated patterns can make. I love the mix of colours and in the still quite dark days of early spring this project brightens up any evening. 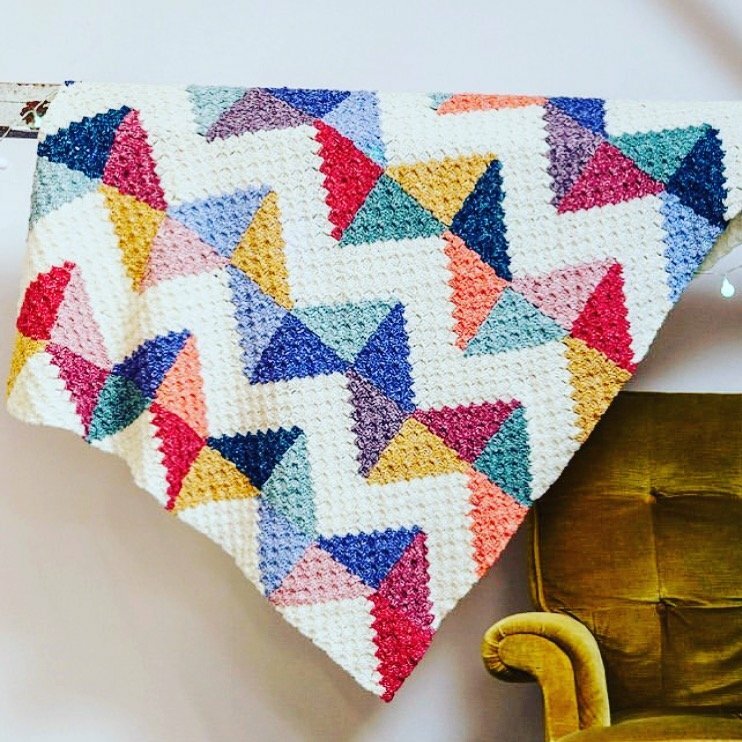 My advice would be to get cracking now and then by the time we have summer picnics and trips to the beach, your new Circus Blanket will be ready and waiting for a fun excursion. 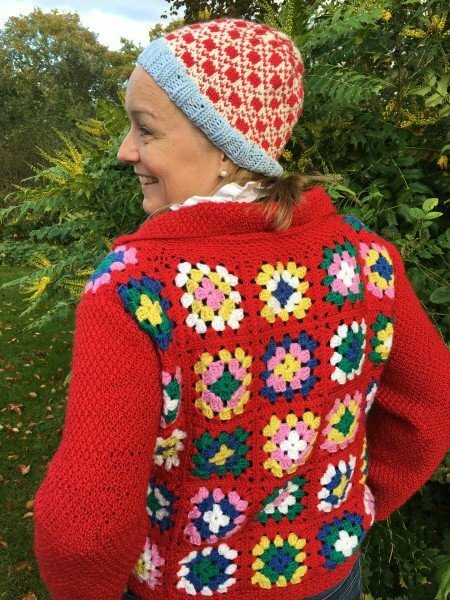 If you don’t live in the UK – you can get the pattern via the Inside Crochet online subscription. Oh what to make…what to make? 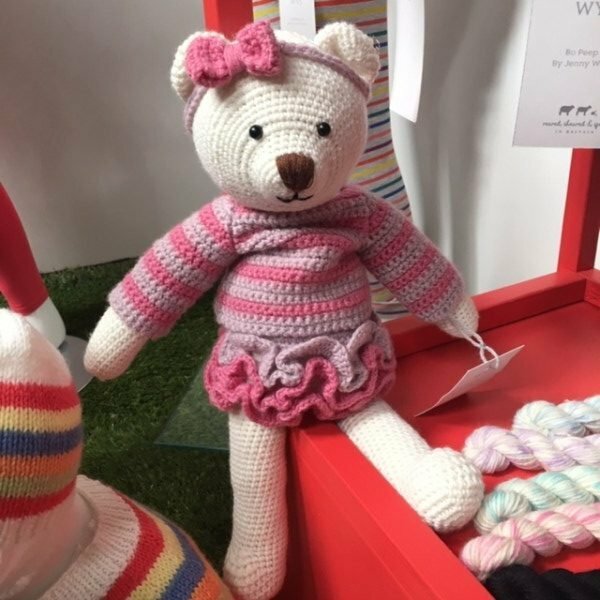 I know if you are like me, you will see something in a magazine or instagram and think, ‘I REALLY want to make that!’ do I have the yarn already….no….ok, I’ll order some now…actually could I pop into my yarn store and start it this evening?’ We can be an impulsive lot. Hey, when the mood takes us, we just have to cast on. Having something manageable and do-able is definitely an attraction. We don’t need guilt in our hobbies and are keen to actually finish what we start. The mounting numbers of ‘WIP’s’ (works in progress) drive us to distraction. The zeitgeist items for makers tend to be accessories or blankets. 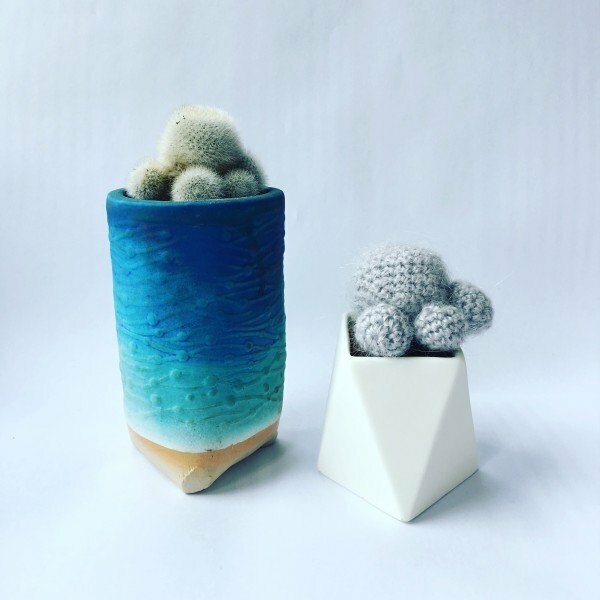 Smaller items or things you can make for the home. Don’t get me wrong, people are making garments, but they tend to be complex and heritage pieces and not made for necessity. 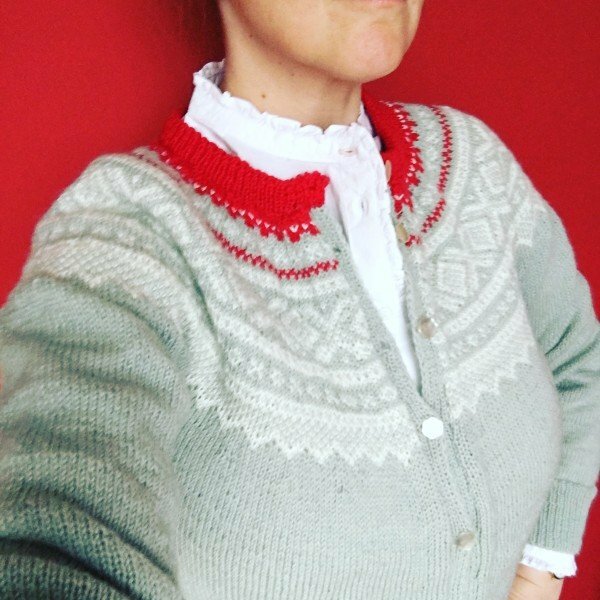 I am perhaps part of the last generation who wore school uniform knitted by my grandma. Bottle green cardigans which swamped me in Autumn and looked tight and pilled by early summer. 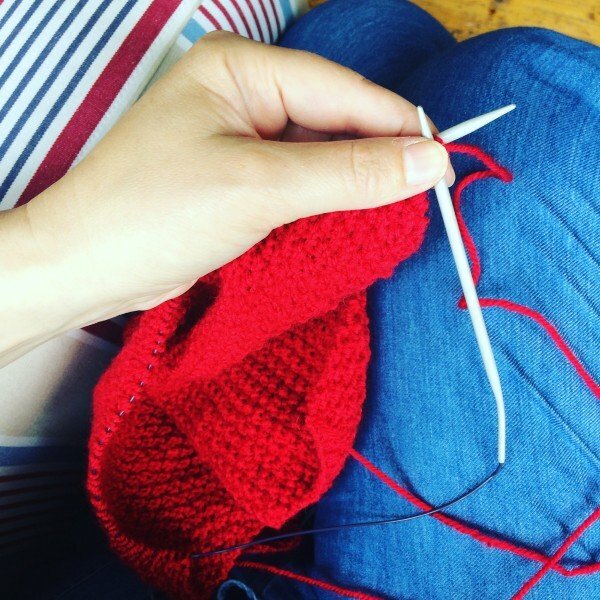 The heartbreak of starting a jumper or cardigan and it looking….’all wrong’ seems to loom large in our minds. 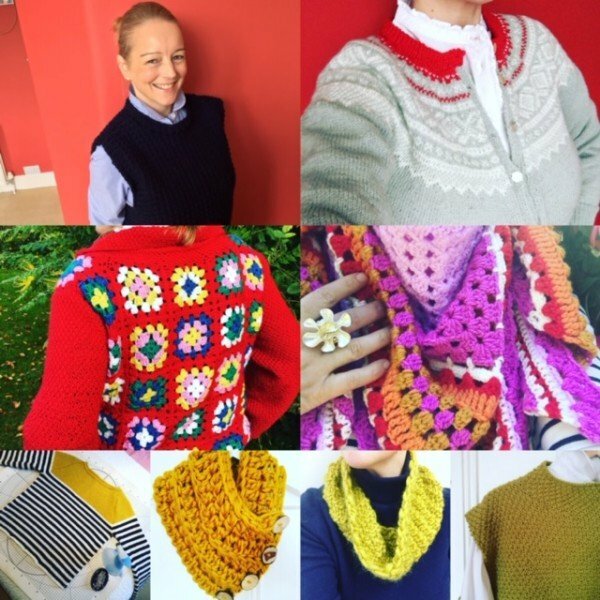 In 2018 – due to promising not to buy any new clothes, I made many more clothes than I had done in years. The experience certainly taught me a few do’ and don’ts. There is nothing worse than devoting weeks and months on a project and then just hating it when you finally try it on. I say this knowing I sometimes shy away from it. But to ensure your garment is really going to fit you, it is worth measuring yourself. I’m going to be honest. I have made a few things that have either swamped me, hanging off my shoulders. Or more likely, I have been a bit optimistic in terms of my size and the end result is unflatteringly tight. Just being honest. The big danger area is obviously the chest. 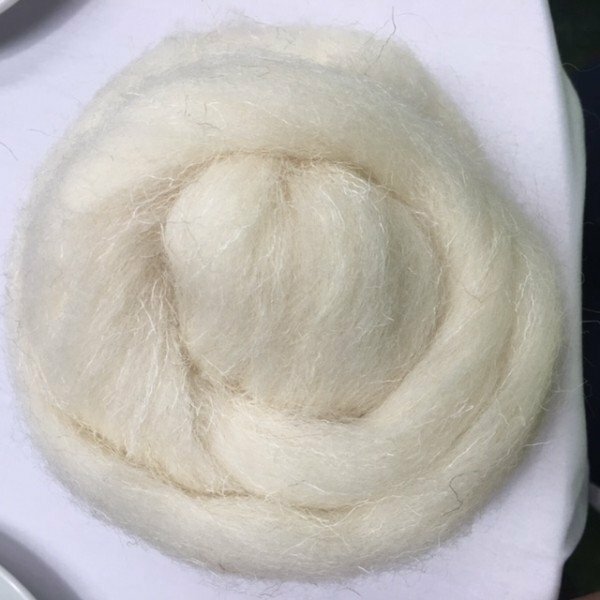 You can easily measure this yourself and honestly if you have an accurate idea of what that is then you can save hundreds of pounds of woolly mistakes. Worth saying though that to get the perfect garment you should have an idea of your body and arm length. I have slightly shorter arms and torso. This means for a jumper to really work I should take a couple of centimeters of the length and it saves me rolling up the sleeves. Lots of people don’t do this…but you know why wouldn’t you make the best you can make. 2. Swatching is kinda worth it. Seriously I know how you don’t want to make a sample square to test your tension. But for garment making it is worth it. I made a really beautiful tank top recently. It is a tad too small because my tension is a bit tighter than the pattern…silly girl. 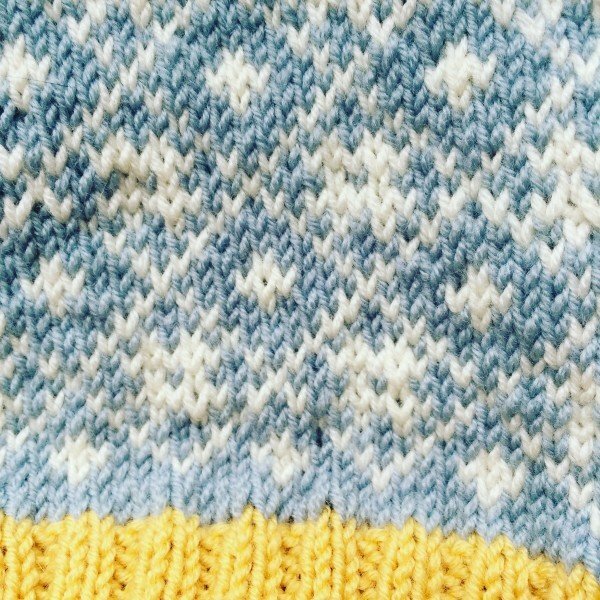 I didn’t swatch the fairisle pattern. Just a short cut too far and now I won’t wear that tank as much as I could have. 3. Have a small practice. 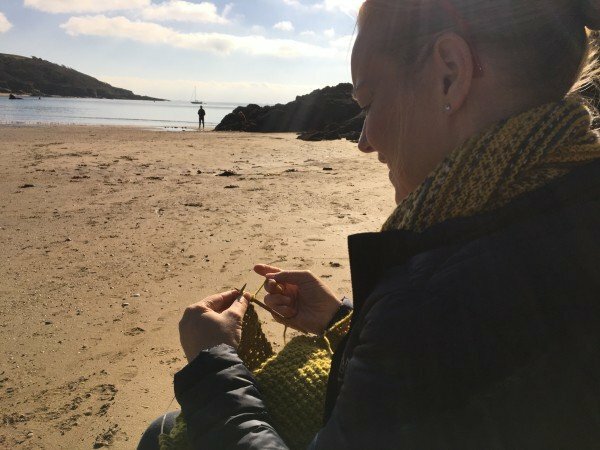 When I first became attracted to fairisle knitting again, I knew I need to improve my stranding technique. I actually attended a workshop with taught by my friend Juliet Bernard. Those few hours were well spent. I made quite a few hats using this technique before I embarked on a cardigan or jumper. 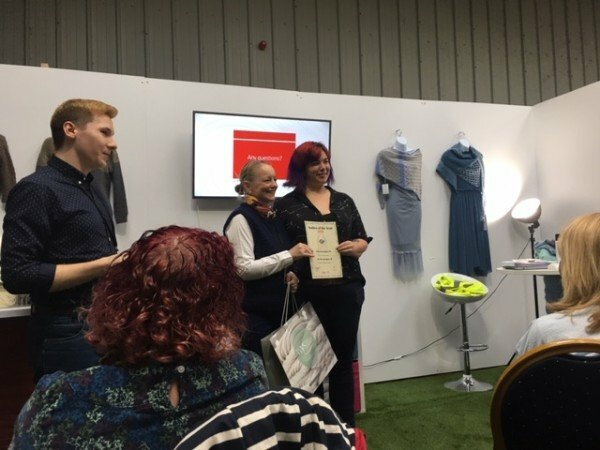 The process helped me iron out the problems and when I did get a bit stuck, the project wasn’t too big that I felt daunted. Rows and rows of stocking stitch 4ply knitting look utterly glorious, but they do require commitment. Who hasn’t made a rib hem just a few rows too short, because they couldn’t bear going on any further with knit 1, purl 1? 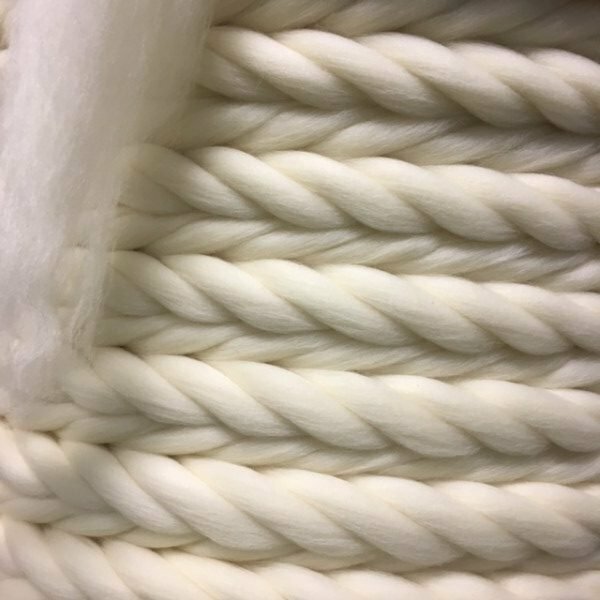 It is no surprise that for garment knitting the complex patterns are becoming popular. 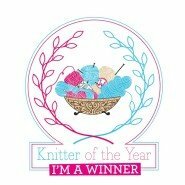 Knitters need something to keep their interest. 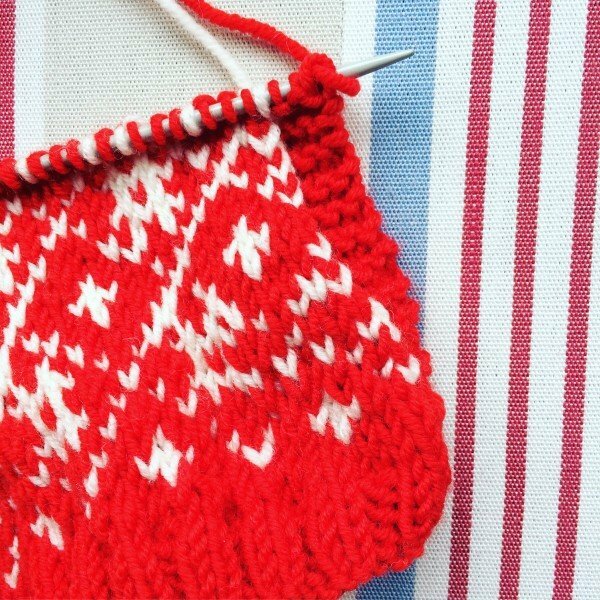 I know that even a stripe can help motivate you through the pattern. That is why fairisle can be so intoxicating. It wrings the changes to ensure that you interest is maintained. 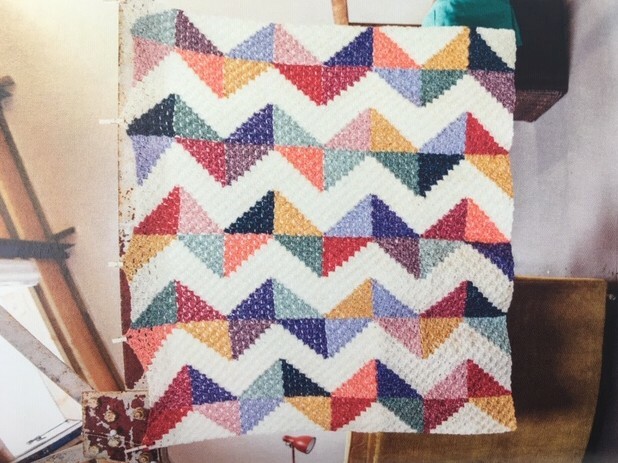 The ideal make has enough interest to keep you going, but is not so complex to incite a migraine – or indeed the urge the throw your work and needles across the room. What have you planned to make this year? This time last year I made the rash decision that my New Year’s resolution would be; buy no new clothes, a fashion fast. One year on, twelve tempting months, how have I got on? Well, I’m going to admit, I really surprised myself. My wardrobe is still bulging but has very few additions. It has been a wonderful experiment and discipline. The most rewarding aspect of this self-imposed denial has been the lessons I have learnt about myself. Things already knew but have come into sharp focus. Firstly, let’s get the whinge out of the way. A few of my friends have chided my efforts. Either they don’t enjoy clothes shopping or indeed don’t have any interest in fashion. 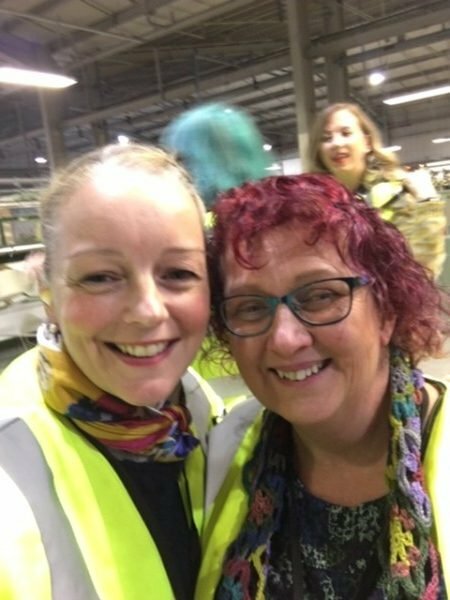 Their view right from the off has been, ‘I can’t see what the fuss is about, it’s so easy… who likes clothes shopping anyway…everyone knows buying fast fashion is wrong…’ Fine I get that. If clothes or fashion are not interesting to you, my little resolution is no ‘biggie’. But then I could quite easily give up drinking tea for a year. I really dislike it so would be no problem. The challenge was personal – failure or success was in my gift. It was my choice of self-discovery and others will have their own personal challenge. Each to their own. The real trick has been to sustain the resolution for twelve months as opposed to a mid-February abandonment of resolve. That my friends is when it hurts. Others friends could really feel my pain. They understood that I would be making decision not to cruise the shops to see what was new. They got the heartbreak of knowing, ‘that dress would be perfect for a party’ but knowing that the season would come and go and the opportunity to purchase it would pass me by. Some people have actually felt quite sorry for me, which is touching and I have received a 2 or 3 items as gifts or hand-me-downs. I have to be honest in each case I was pathetically grateful. Cold turkey is obviously the best discipline for me – Complete denial with a hard a fast rule. Then there is no mission creep. If you want to avoid buying something stay away from the shops, unsubscribe to the shop newsletters and avoid fashion parties etc. The last point is perhaps the most significant bonus of this year. When I was younger I used to make loads of my own clothes. Time and lack of skill prevented me from making more as I have got older. 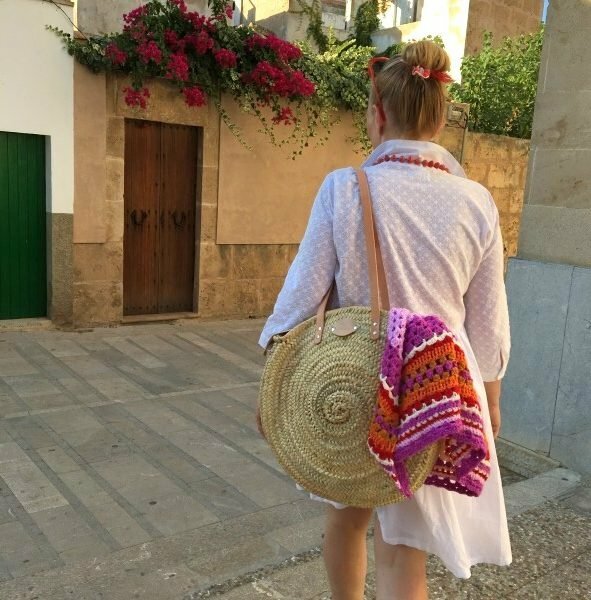 But the self-imposed fashion fast encouraged me to knit or crochet new items to mix up the changes. 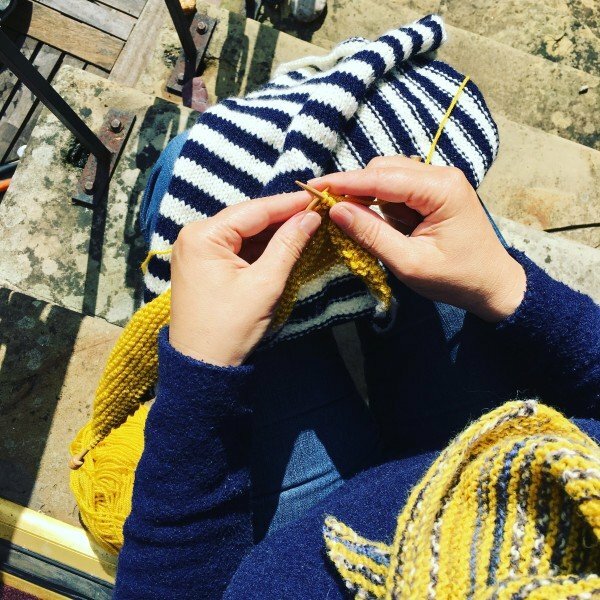 I’ve made two cardigans, two tank tops, 2 cowls, a shawl, 1 jumper and countless socks. All have been worn and I have enjoyed the challenge of solving a creative problem. My lastest make is a total triumph. 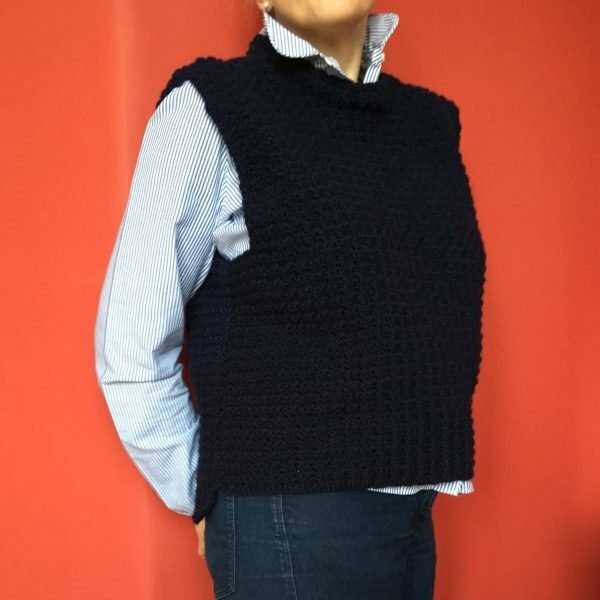 A crochet version of the Cassie Tank Top using Stylecraft Special DK in Navy. I have worn it twice already this week and I adore it. When bored by my choice in-front of the wardrobe I have found solace in accessories. On many occasions scarves and necklaces have come to my rescue to liven up a drab outfit. When January arrives, will I go on a huge shopping rampage? Honestly I don’t think I will. There are a couple of items I really need to renew. Navy and Black trousers for work. I could do with another smart jacket for work and my white shirts are looking on the edge of grey. 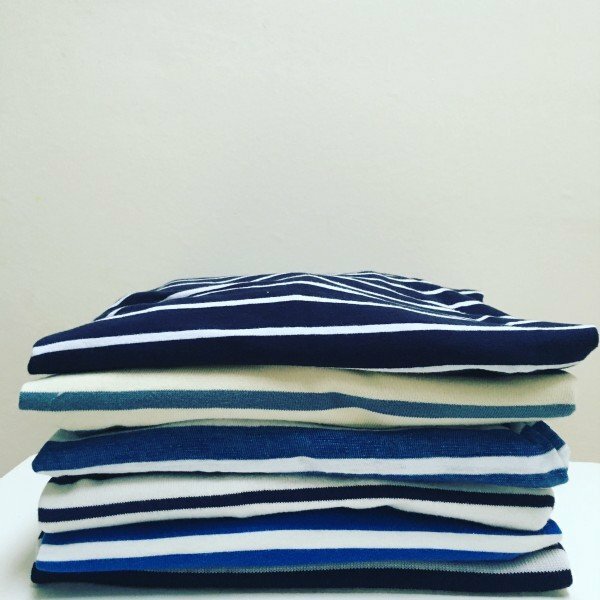 My most favourite blue and white breton top could do with a refresh. However I think that this year has significantly altered my habits. My sense of what suits me is more defined. 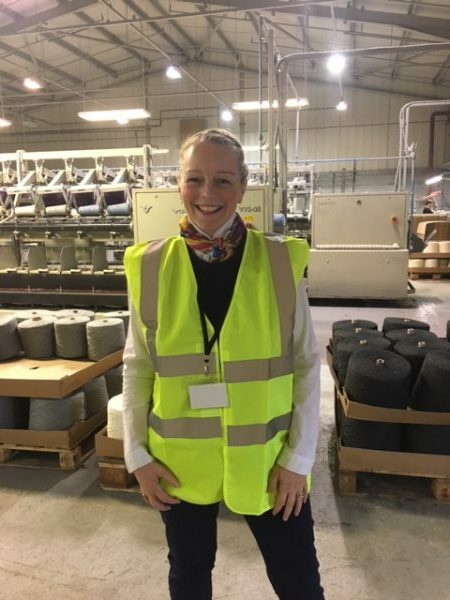 I will aim to avoid rash and impulsive fashion mistakes and I feel more informed about ethical fashion and how the production of our clothes effects the most vulnerable and is eking plastics into our water system. Basically I think my fashion fast has made me a fashion grown-up. 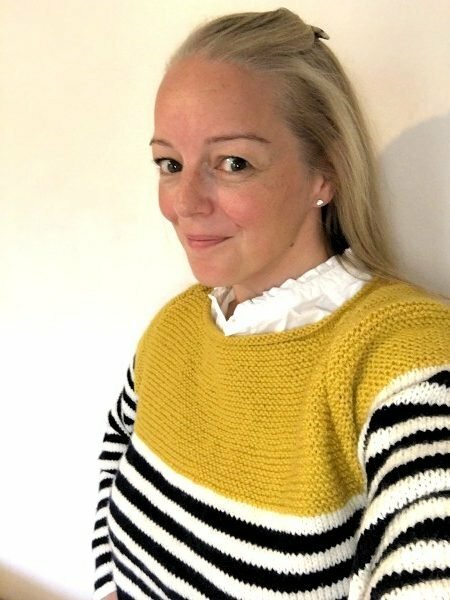 Would I suggest you have a fashion fast in 2019? Well yes if want to save a few quid, discover which clothes you really wear and you will enjoy the creativity of shopping your wardrobe. 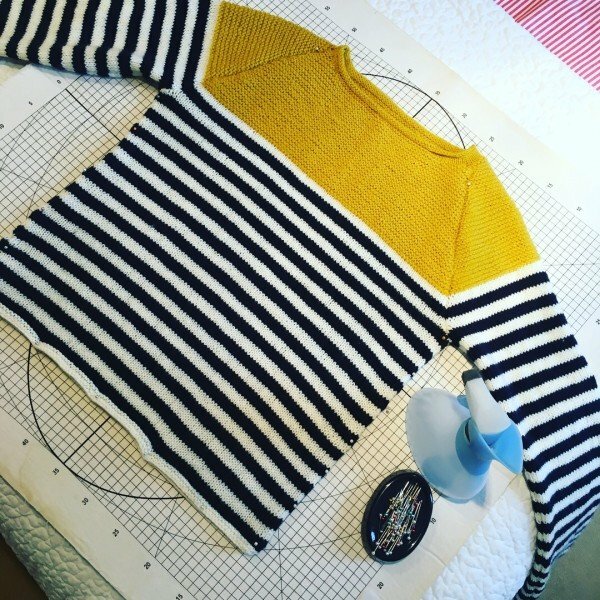 But for now I am planning a big clear-out…anyone want a stripey top? Boy – oh Boy, I have made a lot of items this year. The very scant number of blog posts means that most of those projects I have not been able to share with you yet. Life in 2018, has been busy. I am not complaining, my work has been hectic and I have done much more designing than I imagined at the beginning of the year. I saw a dear friend of mine this week. She said, ‘WHERE HAVE YOU BEEN?! – seriously what have you been doing?’ Good point. When not working there has been quite a bit of secret stitching and that means it takes a while before it is visible. Not excusable, but true. 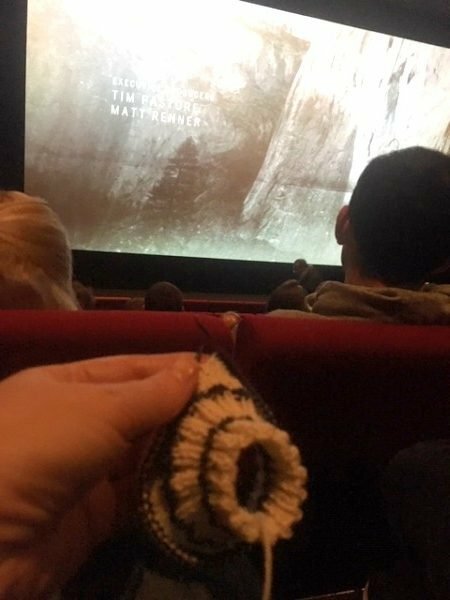 Amongst the book designs and commissions, you know that I have knitted a heap of socks and I have added to my wardrobe by knitting a useful tank top. I promise I will do a round up of my ‘Fashion Fast’ in a few weeks, but I will admit that crashing into Autumn I was slightly bored with the work-wear options. 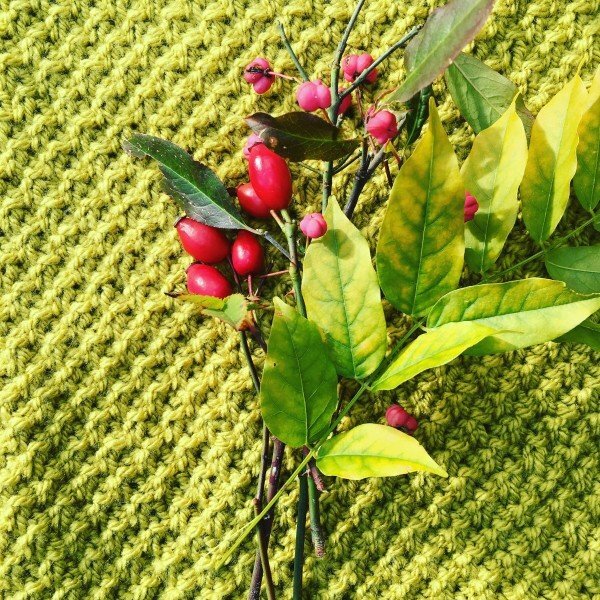 Stylecraft had given me a free ball of a new shade of Special Aran in a glorious Lime. Now this colour is a weird one for me. I don’t often wear green at all. But I know that this colour strangely suits my skin colour. It sort of gives me a surprise tan. I’m not really sure why. I new immediately what I wanted to do with it. 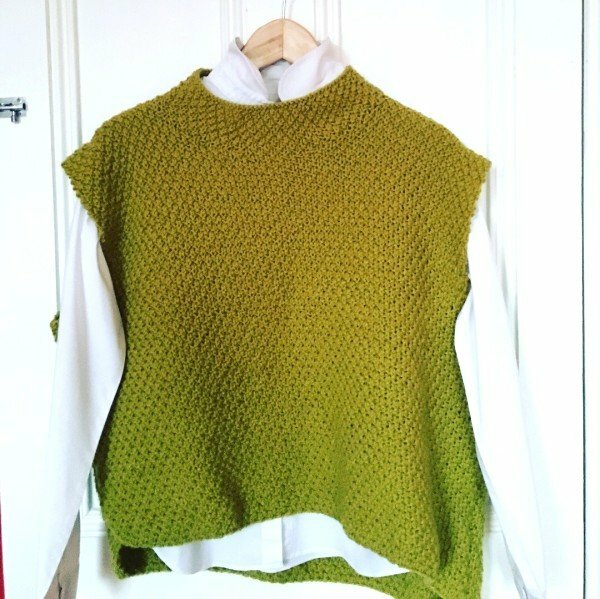 I got hold of three 100g balls and started knitting a chunky tank-top, using a gorgeous perennial pattern from Debbie Bliss as my base. 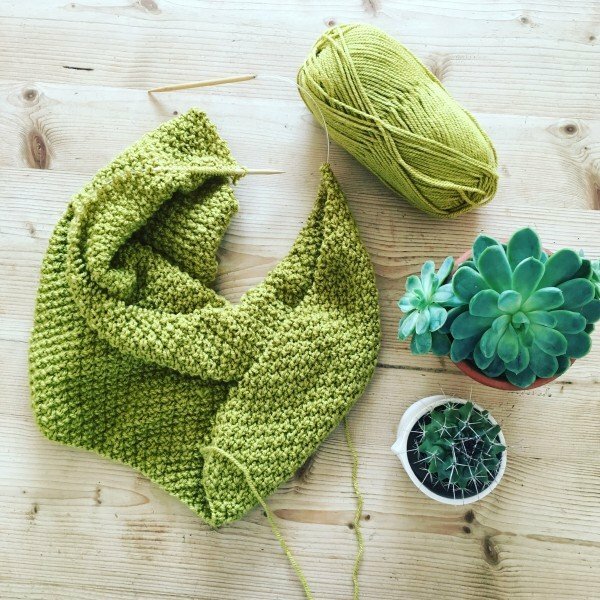 This pattern is called – Cassie I didn’t use the stitch pattern for the design and instead went back to my favourite double moss stitch. 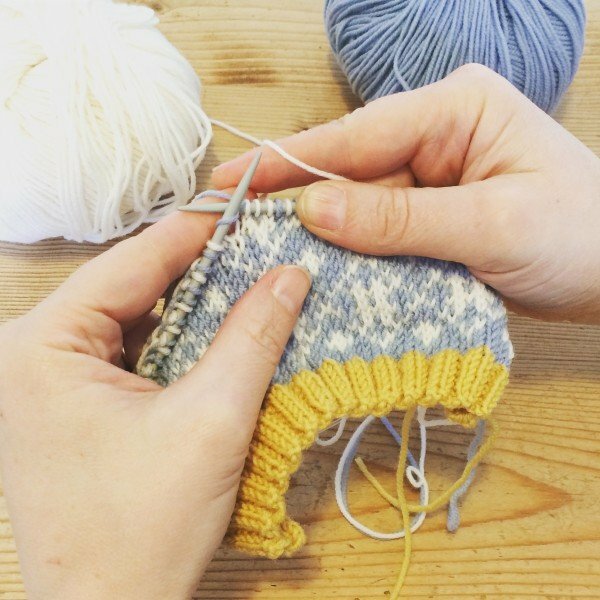 Any moss stitch can seem like a bit of a fiddle. However the aran weight yarn made the project bearable. Very quickly i had made a very simple tank top. If I am honest I should have chosen to make a smaller size. But let’s not worry about that. I have worn the top on several occasions at work teamed with a crisp white shirt. It also serves very well at the weekend. A good addition to the dress-down Friday work-wear wardrobe. I have always liked a tank top for work. You have the freedom of movement but have the warmth which knitwear provides. I am so inspired by how useful this item has been that I am currently making a crochet version using a navy yarn. I cannot wait to see how it works out. If it works I will share the pattern with you. 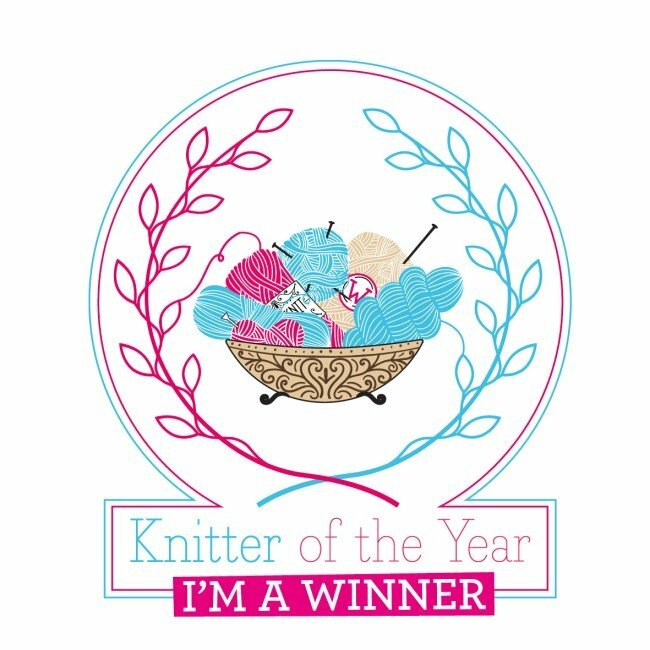 If you are planning to add to your wardrobe this year with you own knitting or crochet please do share your plans with me I would love to know. I have plans already swirling in my head for me next projects! If you have read my blog for a while, you know that I am a huge advocate of ‘blocking’ your work. 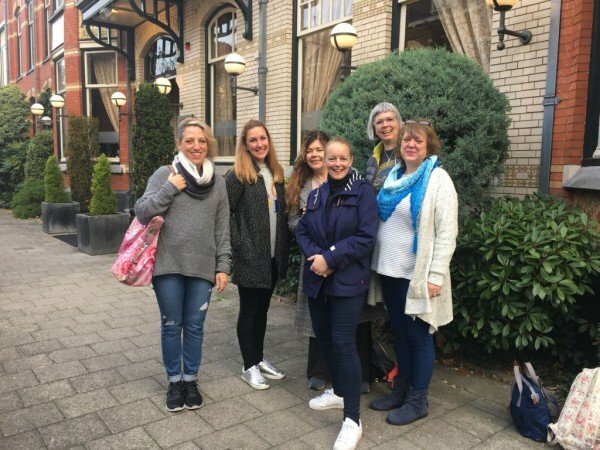 I have written quite a few posts on the matter and whenever I am asked for my top tip I say ‘Block your work it makes all the difference!’ What is blocking? Well if you don’t know it is dampening or wetting your finished knitted or crocheted item. Pinning or stretching it to the shape you want it to be and then letting it dry. 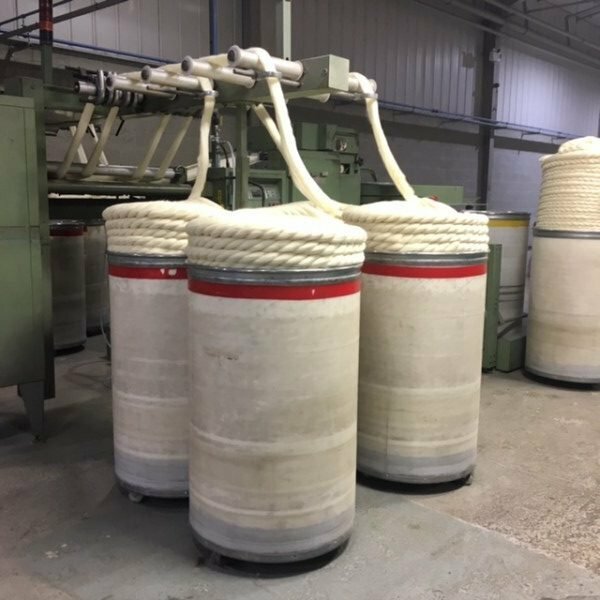 The fibres can relax, the stitches become regular and your can set your finished piece to the measurements you require. You can read a few of my past blog posts here and here. 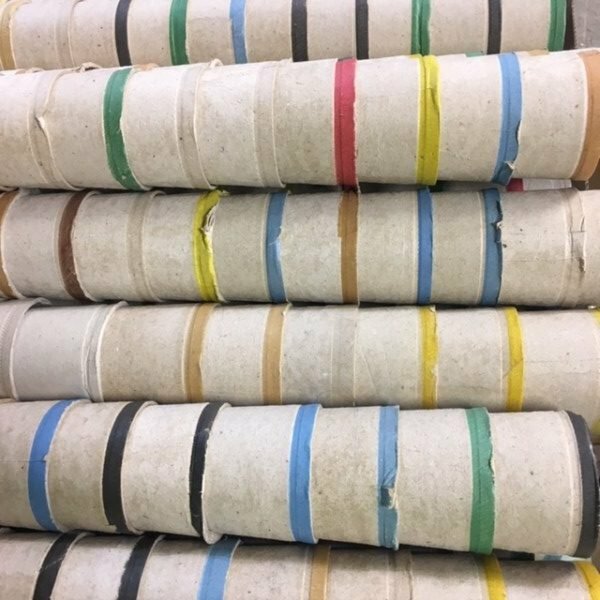 I use a range of techniques myself; including soft boards for garments and templates made to size for my socks. 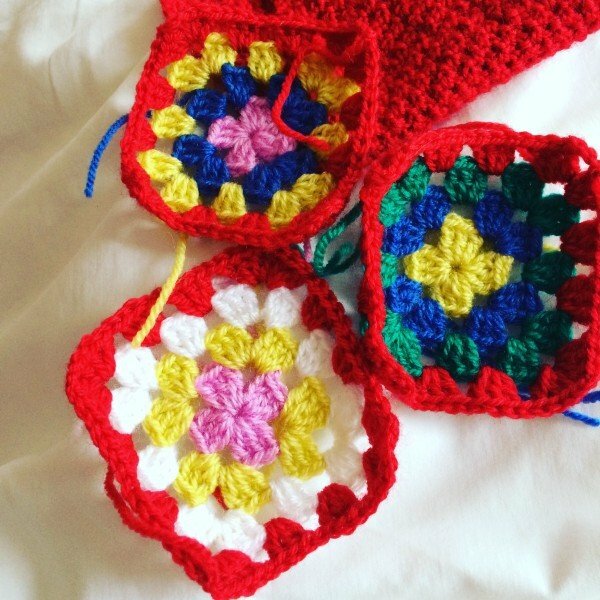 However in the last 18 months I have made a huge number of Granny Squares. 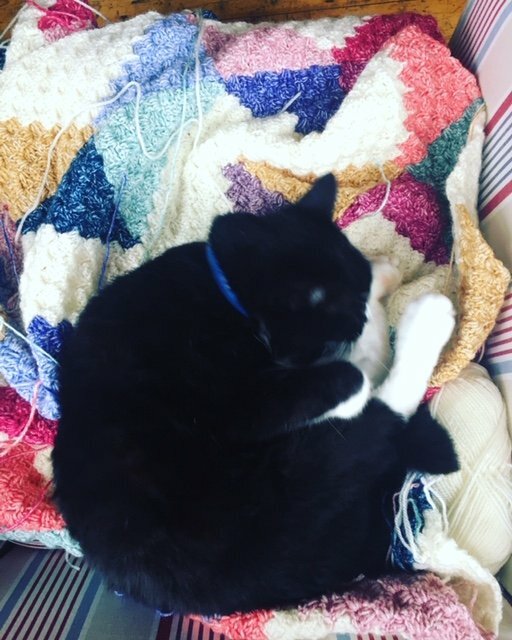 I have written two whole books and completed a whole heap of blanket commissions. 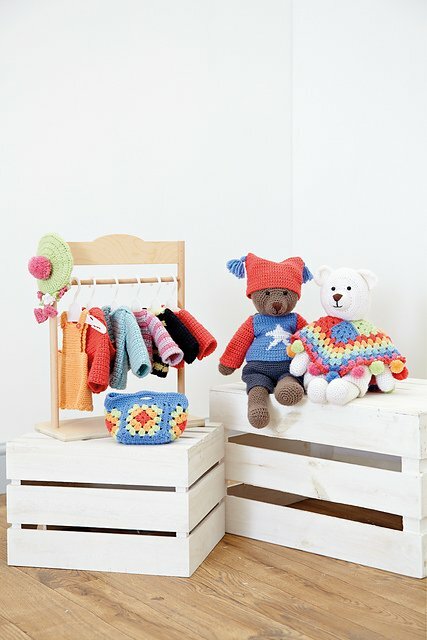 For crochet motifs which are made individually the very, very best way to block is to use a wooden blocking board. 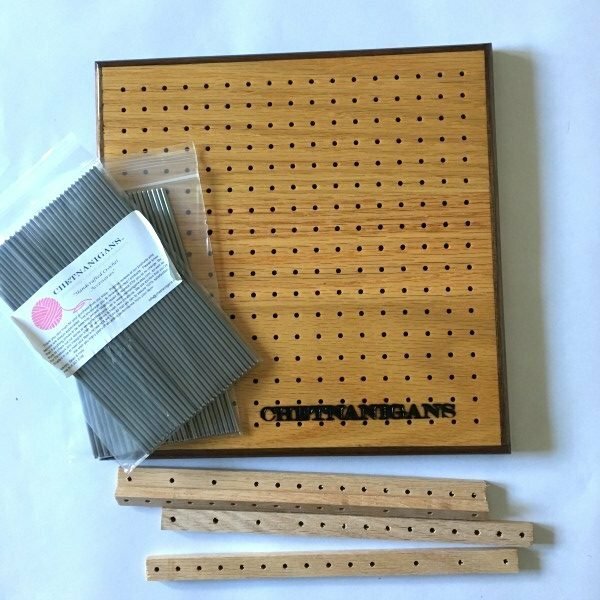 The very lovely people at Chetnanigans contacted me and asked whether I would like to try their Ultimate Blocking Board and see what I thought. Well – oh my goodness, this my friends is a piece of kit. 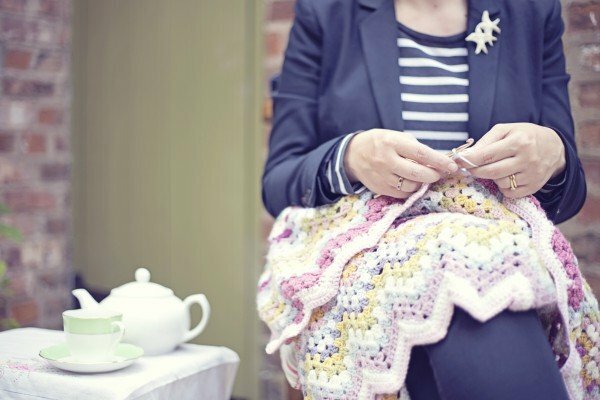 The following information is really for those who love a bit of crochet geekdom. Firstly the board is beautifully finished. It is well sanded and varnished and this actually matters quite a bit to me – as I have on occasion snagged my yarn on boards before. The high quality of the finish also means that I can have a really damp item to be blocked the wood won’t get stained or water-marked. The holes are very close together to insert the blocking pins, 1/2 inch apart, which is ideal. This means I have a lot of flexibility in terms of shape and size. I have trialed blocking a triangle and a circle and it works a treat. 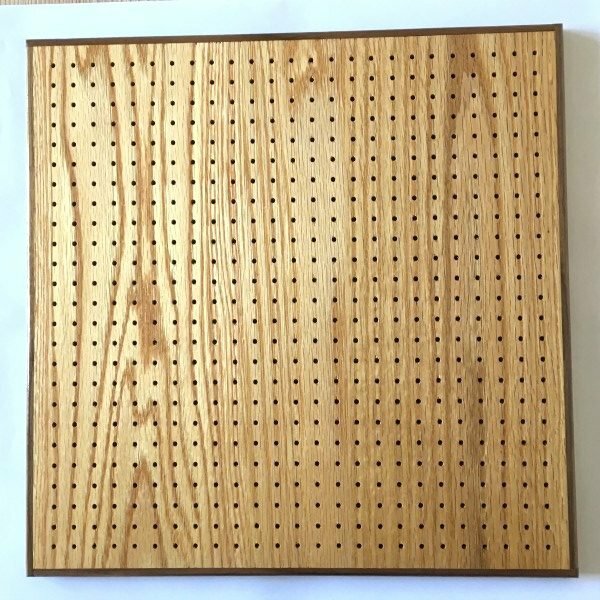 I must say that I haven’t before seen a blocking board with metal pins – these are stainless steel. The improvement is clear. 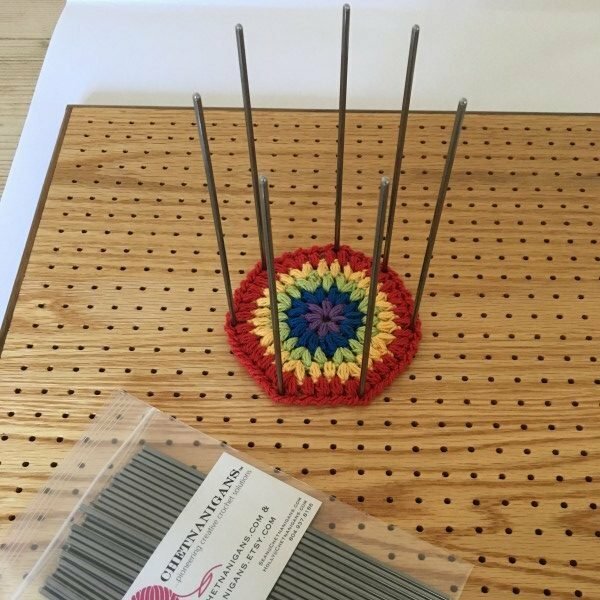 Firstly – you can put more pins in a square without distorting the edge. 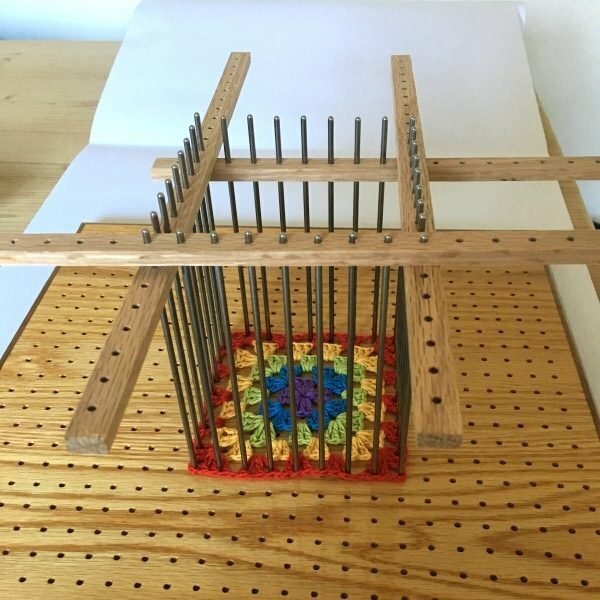 A thicker wooden dowel can create little mini-humps in the square. 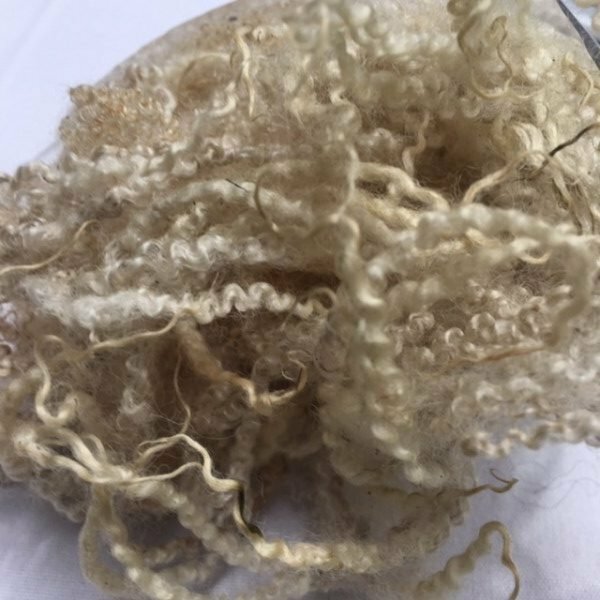 If you are working with fine yarn this will certainly make a difference. another. However, even though you use metal pins the squares will inevetably draw the pins together. The new perfector strips, keep your pins in check and your squares all the same size. Genius. 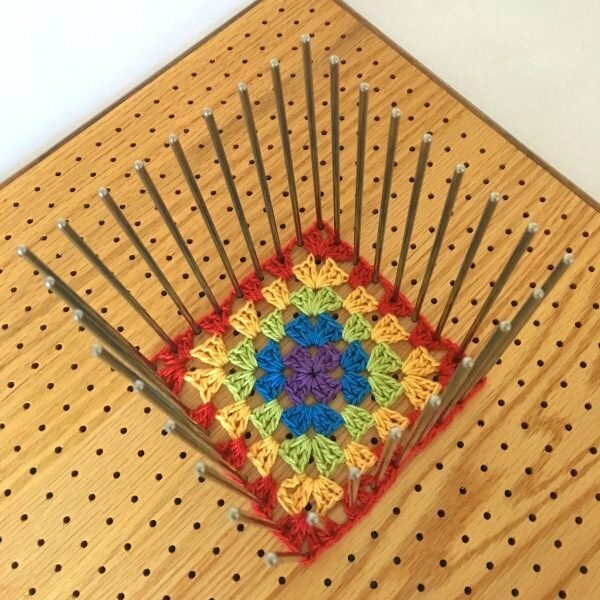 Now if you are a passionate crocheter, I would certainly suggest these blocking boards as a Christmas Present this year. I was astonished by the quality and robust nature of the pins and the perfector strips. This purchase is an investment piece my friends. But I have two great pieces of news for you. I have a unique discount code for you. 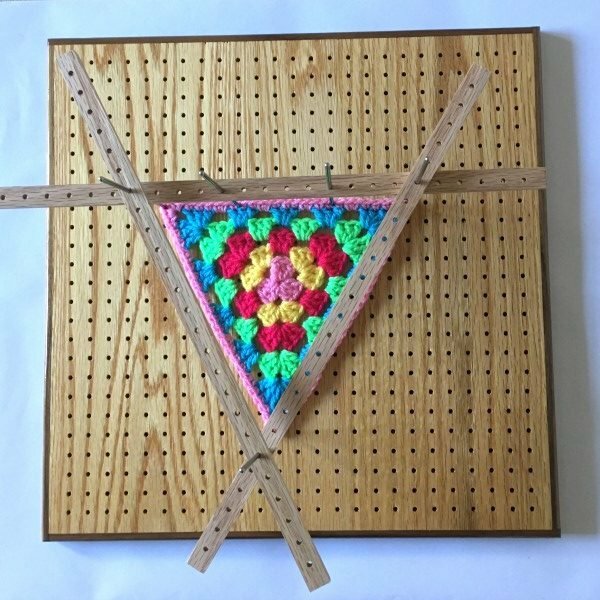 If you buy you blocking board from Chetnanigans and use the code Emma15 This code is valid both on the Chetaningans Etsy Shop and their own Chetaningans website until Friday 26th November – so get ordering. Other brilliant news is that I have the best ever give-away opportunity for you. One lucky reader will be chosen at random to receive a 8″ Premier Blocking Board Ultra, display stand, blocking pins and perfector strips. This is an awesome giveaway prize and I cannot tell you how excited I am. All you need to do to enter is to ensure you subscribe to my newsletter, leave a comment below telling me why you would love to win this prize. The giveaway will run until Saturday 24th November, when I will be choosing a name at random. Good Luck! – This giveaway is now finished – Congratulations to Sharon – who was picked at random! If you are not in the market for a blocking board – have a look because there are loads of products to add to your wish-list for Christmas! 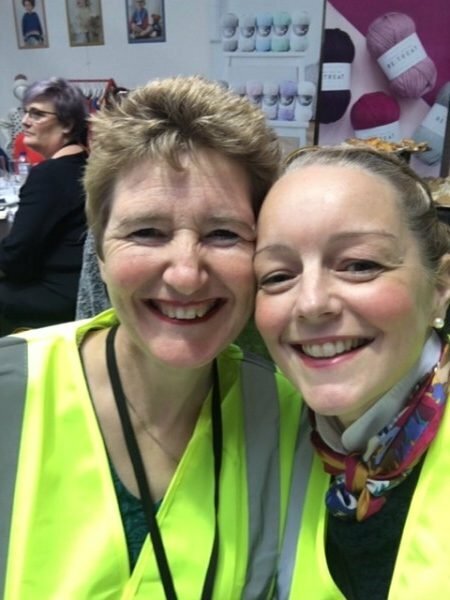 It would be worth checking out their Facebook page and Instagram account – I think Sean and Holly are developing new products all the time – responding to the needs of their customers and they are always looking for suggestions and new ideas. I have been happy to work with Sean and Holly at Chetnanigans – they sent me their Ultra Board to trial for free to see if I liked it and could recommend it. I happily recommend it to you and I am delighted that they have sent me a discount code for you and a giveaway to share with my readers.